Special note: This review was written following a preview performance. During previews, the production is still able to rehearse and elements may change before the official opening. I don't think there's anyone working in the American theatre today whose work I feel quite so drawn to as Mary Zimmerman's. I'm fascinated by her process, her commitment to creating for and with artists with whom she has an established creative relationship, her ability to create indelible images in the audience's mind, whether out of the tiniest movement or written large across the stage. Her plays are dry and funny and lyrical and deeply moving. The first time I heard her speak, I wanted to sit at her feet and learn about The Theatre for as long as she would teach me. I've never actually spoken with her, of course, but by heaven, I've gone to every single show she's worked on since I moved to DC. I know by now her directorial tics, the things I'm guaranteed to find in every show I see (a magical wooden box for a set and a small boat are my favorite from the checklist a friend and I created a few years back). (L to R) Doug Hara and Tempe Thomas in Metamorphoses at Arena Stage at the Mead Center for American Theater February 8-March 17, 2013. Photo by Teresa Wood. 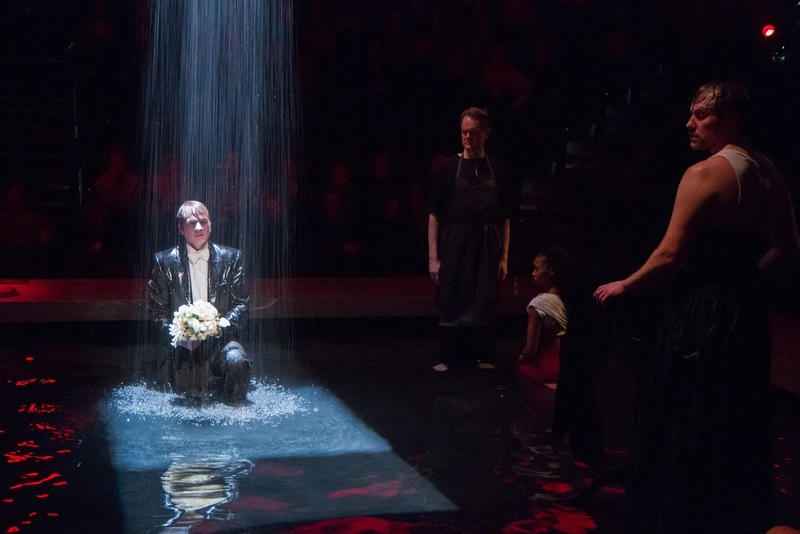 Now that I have laid bare my idolatry, you'll understand the nature of the high-pitched noises I emitted when Arena Stage announced that Zimmerman would be bringing her production of Metamorphoses to Arena early in 2013. As you can imagine, my anticipation was as high as my expectations. In the last hour leading up to the curtain time, I had full on pre-show jitters the like of which I only experience when I'm the one about to perform. Could this production possibly live up to my hopes for it? I have to give some of the credit to the element of surprise and wonder that comes when I see a new show, one I know very little about. For all that I love Zimmerman, I don't know Metamorphoses. I knew the play would be based on Ovid and the myths I’d grown up loving and that there would be water. Lots of water. I think the best moments in the play are the ones that quietly build up until that one perfect line or image is revealed or revisited, and I don’t want to take away from that experience for anyone unfamiliar with the show. I’m a big fan of going blindly into a play, and I think it pays off here in a lovely way. I can’t NOT talk about the water, of course. I’m one of those theatregoers that loves to get as close as possible to the stage to feel the greatest connection with the energy of the actors. Imagine my delight when an email arrived, warning of what amounts to a “splash zone” for the first two rows- it’s essentially the apotheosis of my “seat me so close the actors wind up spitting on me” philosophy. The water can add to the sense of fun and beauty, but what really struck me throughout the production was the danger that it added. Violence becomes magnified in an important way – we worry about an actor drowning, about a misjudged throw or leap in a way that normally I’m not fussed about in the theatre. It’s not that I don’t trust the fight choreography, but the unpredictability of water is a fascinating element to throw into the theatre. Transformation is at the heart of the play, and I love watching the way that playing scenes in water alters them and changes the audience’s perception as well. There’s a lot of gorgeous work being done in this production. I would be hugely remiss if I didn’t credit the lighting design of T.J. Gerckens. His ability to transform Daniel Ostling’s magnificent set from one emotional tone to the next is brilliant to watch, and there are moments that are breathtakingly beautiful thanks to his work (I know I promised no spoilers, but- the melting? Achingly gorgeous in that dim, golden light). Doug Hara is a joy every time he arrives on stage, and Louise Lamson does beautiful work in a succession of roles (everyone plays multiple parts throughout the evening, and this very strong ensemble juggles them well). I’m always delighted to see Geoff Packard on a DC stage and I couldn’t stop giggling at his musical turn as Apollo. Special kudos go to Ashleigh Lathrop- her Myrrah was heartstopping, riveting, and beautiful in its tragedy. 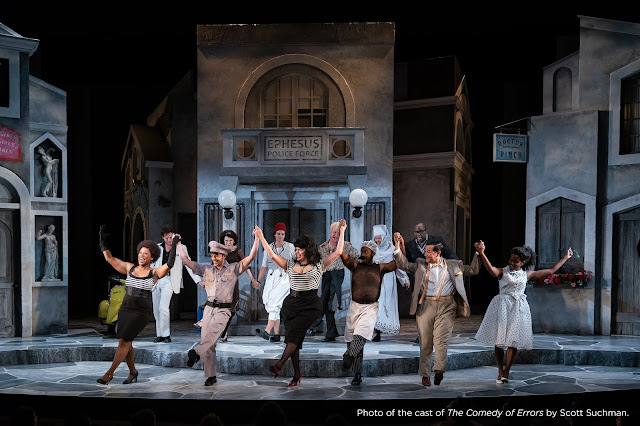 Geoff Packard, with Raymond Fox, Ashleigh Lathrop and Chris Kipiniak, in Metamorphoses at Arena Stage at the Mead Center for American Theater February 8-March 17, 2013. Photo by Teresa Wood. I love stories, and I love the way that Mary Zimmerman tells them. I went into Metamorphoses because of my faith in her artistry, and I’m so pleased to say that it was rewarded. Within 48 hours, I’d bought another ticket to come back and see the show again- this time, front and center in the splash zone. I can’t wait- there’s a heap of good theatre happening right now in DC, but make sure you don’t miss out on this one.